Trust Ring's Manufacturing Blue Guns for accuracy in law enforcement simulation training for weapons usage. 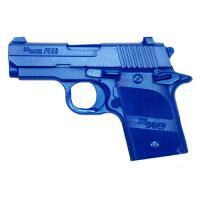 Renowned in the industry and popularly referred to as Blue Guns, the replica is hand-crafted from sturdy urethane. Ring's replicates the Sig Sauer P938 down to the minutest detail for a simulator that truly resembles its real cousin in look, feel and weight. Safety is not dismissed as the distinctive blue color identifies this item as a simulator, avoiding potential confusion about whether or not an actual weapon is present. Note: FIREARM SIMULATORS AND/OR REPLICAS CANNOT BE SHIPPED TO CANADA. Great product. Would be perfect if there was an option for the extended magazine.